Once I had my Muppet picked out I studied pictures of him and took measurements of his facial features so that I could proportionately fit it onto a 17 inch round head. I made the head out of a 17-inch round balloon and Papier-mâché. You must use about 4-5 layers of Papier-mâché to ensure that the head is firm and sturdy enough. I suggest using a blend of flour, water and Elmer’s glue to help create a proper paste. Also, don't be afraid to get a little messy - it’s inevitable. Upon drying, I then measured and carved out the mouth and base so that my eyes would match up with the hole in the Count's mouth. From there, I used insulation foam, a pillow and a small bicycle helmet to create padding and stability so that my head would rest comfortably inside the head of the costume. Using a spray adhesive, I wrapped the entire head in lavender-colored fleece, covering all of the Papier-mâché. While doing this, it is important to eliminate as many visible creases as possible. I was able to achieve this by pre-measuring what areas the Count's hair would eventually cover. Using the measurements I had extrapolated from the picture of the Count, I created the eyes out of foam core and fleece, and the ears and nose out of cardboard and fleece. I then created the eyelashes and pupils with black poster board. Finally, I covered any other exposed areas with remaining fleece. I purchased black fur from a fabric shop and used the same spray adhesive to glue it to the head. Creases are less of a factor with this because the fur is so thick that any creases, if present, were barely noticeable. Then, using scissors and a razor I essentially played barber, attempting to replicate his widows peak and side burns as appropriately as possible. Now it was time to focus on the accessories and body of the costume. I knew that I wanted to keep my body fairly human-like so that I could move around easily. 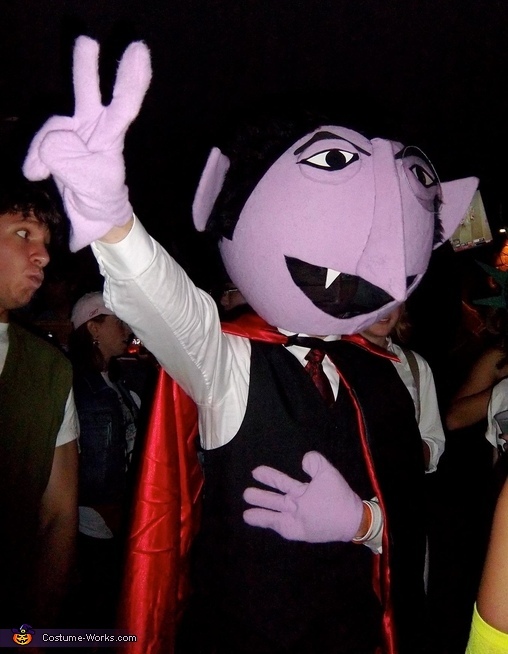 I matched my outfit as closely to the Count's as possible and wore a black vampire cape with a white dress shirt and vest. I wanted to eliminate as much skin exposure as possible, so I fashioned some gloves (4-fingers, of course) out of the leftover fabric. After that, it was show time. Count away. I hope that's also a V for victory on Tuesday for our President. Count them - 1-2 -3 -4 more years! !